ARGUS is a kit built Chester Yawl from Chesapeake Light Craft. Argus was a many-eyed creature in Greek mythology. James Fullton grew up in Alabama. His dad, Jim, grew up on the banks of Dog River, an estuary that rises and falls with the tides of Mobile Bay, and his grandparents, on both sides, were Alabama river people. Boats were a part of the family’s daily life. 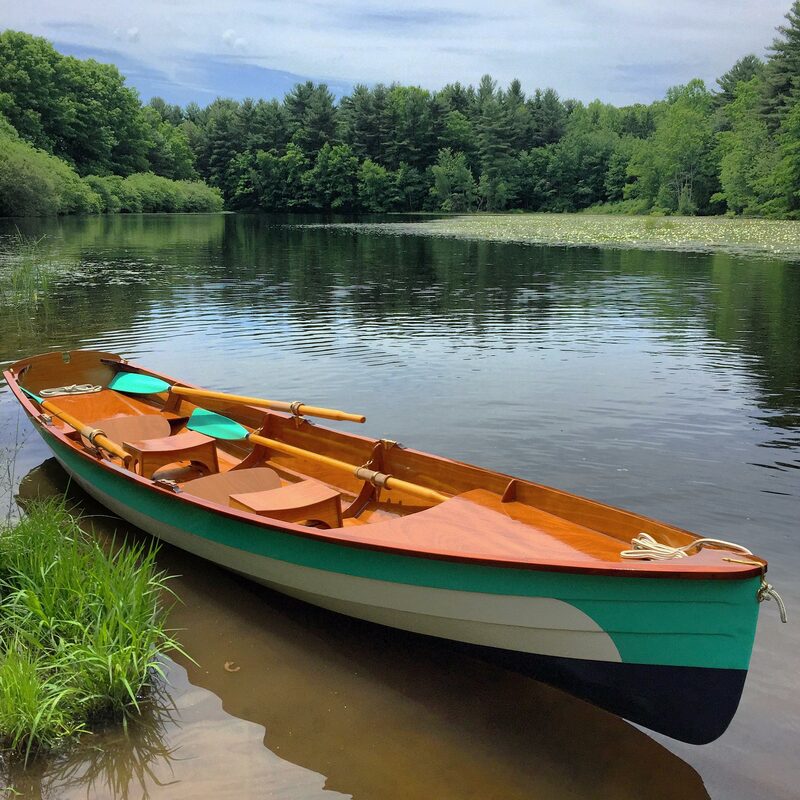 Grandpa Fulton built and restored boats for Jim and his two older sisters in their younger years, and when they had families of their own there were boats for the grandchildren. 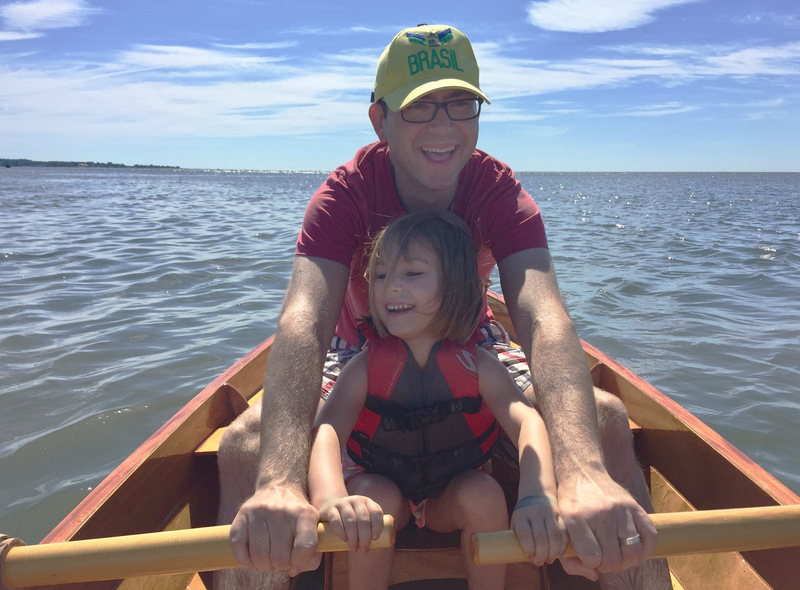 By the time James was seven years old, he had learned to row in a dinghy that his grandfather had restored. His early sailing experiences were in his father’s Fish-class gaff-rigged sloop, and the first time they took it out James was alarmed by how much the boat heeled under the press of sail. He told his father: “If momma sees us doing this, she’s gonna fuss.” From that day forward the boat was called MOMMA’S GONNA FUSS. Jim moved his family away when James was eight years old, but they continued to visit Alabama, spending summer vacations on Dog River. In his ’tween years, James graduated to an outboard skiff and expanded his exploration of the river. The family made several more moves in his teen years, and the gap separating him from the river and boats widened. Jim squeezed out beads of thickened epoxy along the laps prior to pulling the wire stitches out. Some 16 years ago, James settled in New Haven, Connecticut, to raise a family of his own. 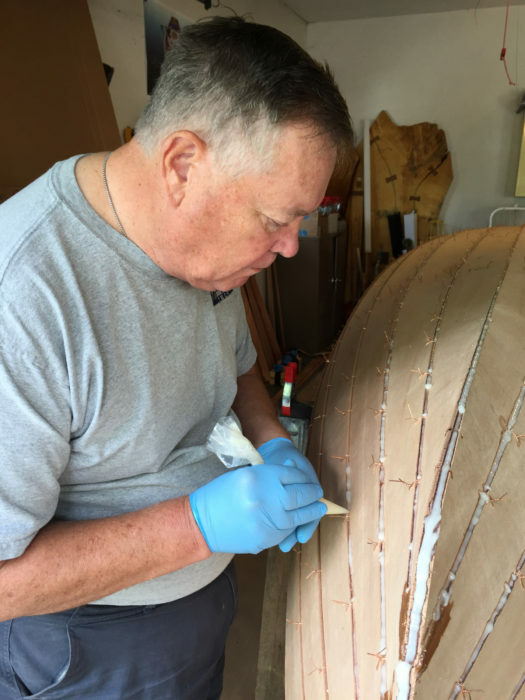 The proximity to Long Island Sound and to the state’s lakes and rivers rekindled his interest in boats, and for several years he harbored a wish to build a boat. In 2016, he talked it over with his wife and they ordered a Chester Yawl kit from Chesapeake Light Craft. Soon after, as a Father’s Day gift, he took his dad to The WoodenBoat Show at Mystic Seaport, where the kit was waiting for them at the CLC booth. James’ daughter Kyrie was three when construction began. 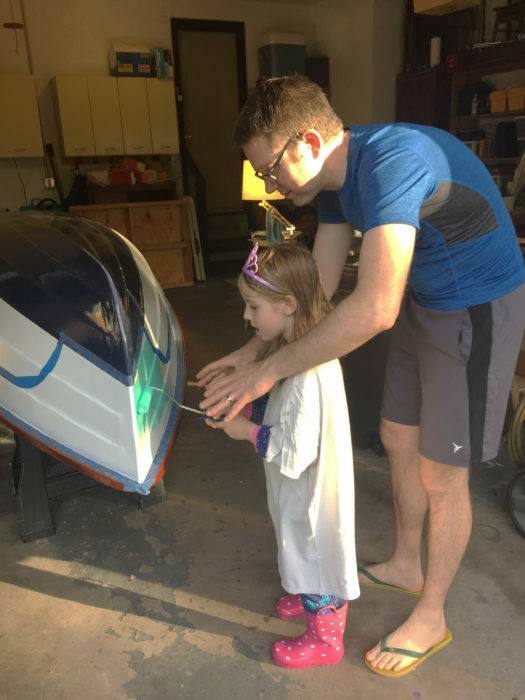 By the time she had turned four, she had taken an interest in helping build the boat. In the months that followed, Jim and James, father and son, assembled the 15′ hull, enjoying the other’s company as much as seeing the curves emerge from the flat plywood panels they stitched together. Jim eventually ceded his role as co-boatbuilder to his granddaughter, four-year-old Kyrie, the youngest of James’s five children. 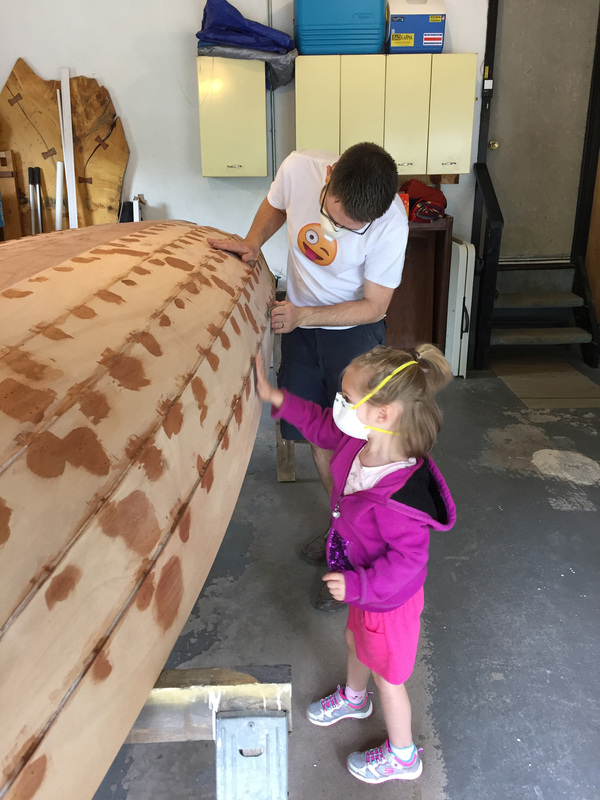 Kyrie had her own toolbox and projects to work on, but often suited up with the proper protective gear to help with the sanding and painting of the Chester Yawl. Kyrie, here practicing coloring inside the lines, had turned five years old by the time the boat was finished and ready to launch. 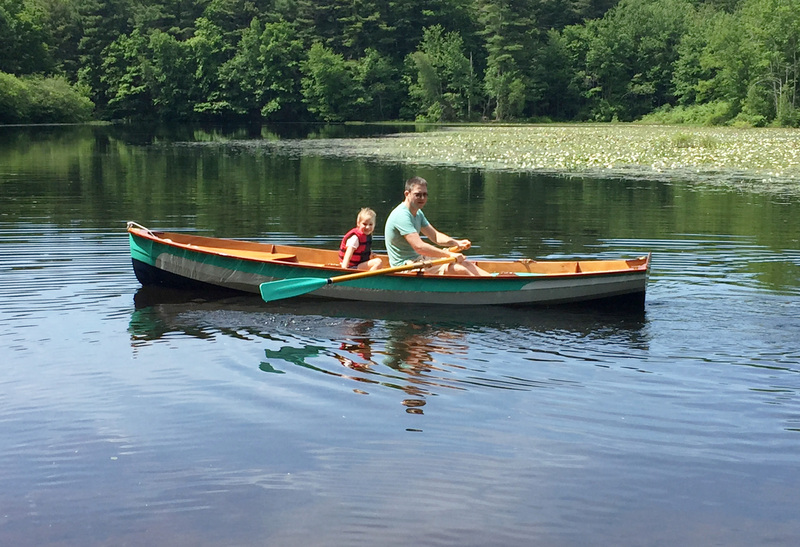 The boat was launched on June 10, 2018, on Lake Wintergreen at West Rock Ridge State Park in Connecticut, and christened ARGUS. Kyrie had earned her place aboard with James for the first row from shore. The boat was launched on Lake Wintergreen in Connecticut’s West Rock Ridge State Park. James and Kyrie take the first row. Father’s Day fell on the following weekend. James’s two sons, 12 and 16 years old, gave him a note saying they both wanted to spend some “just us men” time with him aboard ARGUS. Father and daughter enjoy the fruits of their labor; another generation is brought into the fold. Have you recently launched a boat? Please email us. 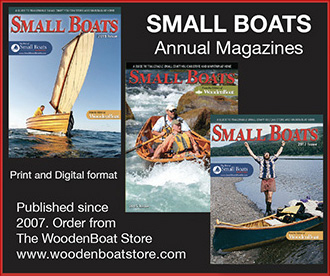 We’d like to hear about it and share your story with other Small Boats Monthly readers. I, too, live in the New Haven area and have built my own small boat (a Goat Island Skiff). I’d love to get together with other local boat builders for group sails. Is there any way to get my contact info to James? I’ve forwarded your note to James. While we don’t publish the contact information our contributors, I’m happy to connect readers with them. Just post a comment or email me. The WoodenBoat Forum is also an excellent way to connect with the global as well as your local boating community. Beautiful boat, and I love that it was a family project!